Teen Vaping. What Parents Need To Know. Teen Vaping or e-cigarettes is becoming a nationwide epidemic. For the past fifteen years, thanks to public awareness campaigns, traditional cigarette smoking has been on the decline. Recently however, the mass production and marketing of e-cigarettes (or, vaporizers) has led to a nationwide increase in teen nicotine consumption. FACT: In 2015, 16% of HS students and 5.3% of MS students had used an e-cigarette or vaporizer in the past 30 days (Surgeon General’s Report). Fueling this increase among younger teens has been the Juul vaporizer and other knock offs, which are small in size (it can be hid and used in the palm of the hand) and offer nicotine pods in a variety of sweet flavors. Simple to use, a rechargeable battery (USB) activates a heating element when the teen inhales on the end of the pen. That element heats the pods liquid mixture into a vapor (just below the combustion point as with a traditional cigarette). The white colored vapor is then exhaled in a small stream about the width of a pencil. Due to the small size, slight odor, and short-lived color of the vapor, students are able to exhale into their shirt or hoodie without being detected at home or even in a classroom. 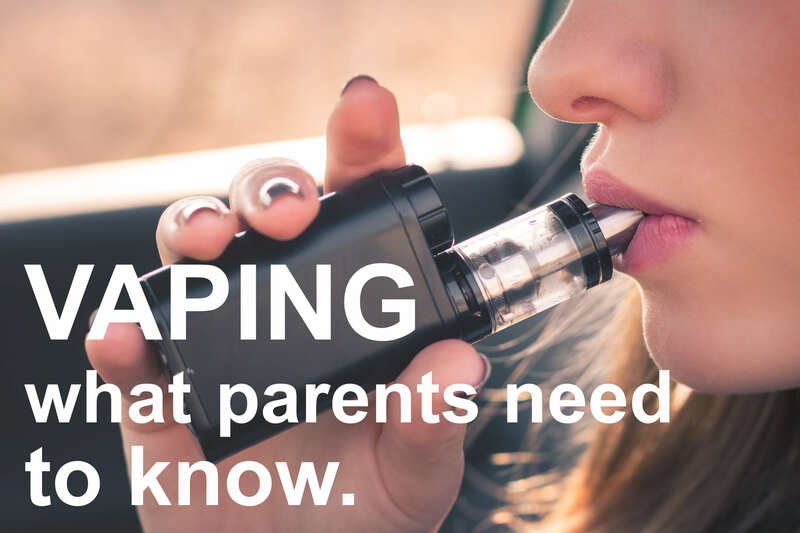 If you search online, you can find sites dedicated to “stealth vaping” with vaping camel backs/hoodies and talking points on how to convince parents that these are safe products. Also fueling the increased usage is its inexpensive cost. A starter set runs about $60 and includes 4 pods. Each pod is the equivalent of 2 packs of cigarettes in puffs and nicotine dosage. Additional 4 packs of pods range from $16-20. The equivalent cost of cigarettes would be double. While students know that cigarettes have dangerous health consequences, they tend to view these products as harmless as they are easy and fun to use. In reality however, nicotine is one of the most addictive substances for humans because of its ability to bind with our neurotransmitter receptors (this is an annual role play in 7th grade). Chronic smokers are using vapes as an alternative to smoking and a way to decrease dependence on nicotine. For young users though, vaping can become a gateway to nicotine addiction. Poor regulation of the industry also means wide variability in possible toxins and cancer causing compounds in the liquid pods. The rapid growth of the teen brain, nicotine exposure has a major impact on the development of the frontal lobe and can lead to life-long impulse control and mood stability issues. Stay informed. Visit a vape store and see what products are on the market. Research online to see what sites your adolescent might find. Stay current with any research on the topic. Study and support product safety regulations. The FDA recently ruled that Philip Morris couldn’t advertise that their new e-cigarette reduces the risks of tobacco-related disease. Talk to your adolescent about the dangers of addiction and toxin exposure. Brainstorm how to respond if a peer exposes them to a vape pen. Validate that nicotine can be relaxing in the short term, but use over the long term creates the need for a higher dose and possible lifelong dependency. Help your adolescent be media savvy. Advertising for vape products is always going to make it look safe and fun. It’s what advertisers don’t tell you that counts most.